Hearthstone Update – November 29 – Rastakhan’s Rumble! Rastakhan’s Rumble, is a knock-down, drag-out, no-holds-barred expansion for Hearthstone featuring 135 new cards, starting December 4! Legendary Champions and Loa minions for all nine classes! Enhance their powers with new Rare quality Spirit minion cards! New keyword: Overkill! Do extra damage for powerful bonuses! 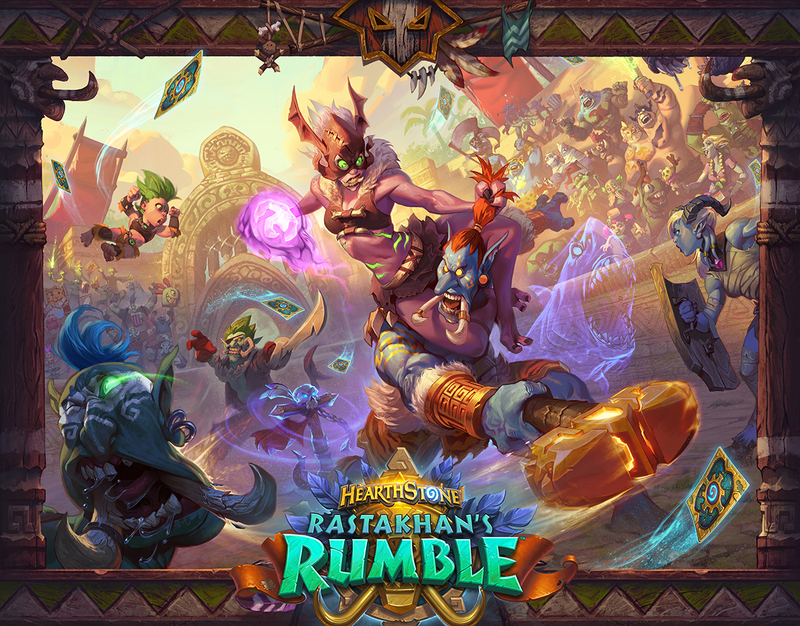 Rastakhan’s Rumble free single player content, Rumble Run, opens December 13. For a limited time after Rastakhan’s Rumble begins on December 4, log in to claim 6 Rastakhan’s Rumble card packs, as well as a random Legendary Loa minion and 2 copies of the Spirit card for the same Class—FREE! When choosing a minion to Transform into, these cards now show the minions the card can become. 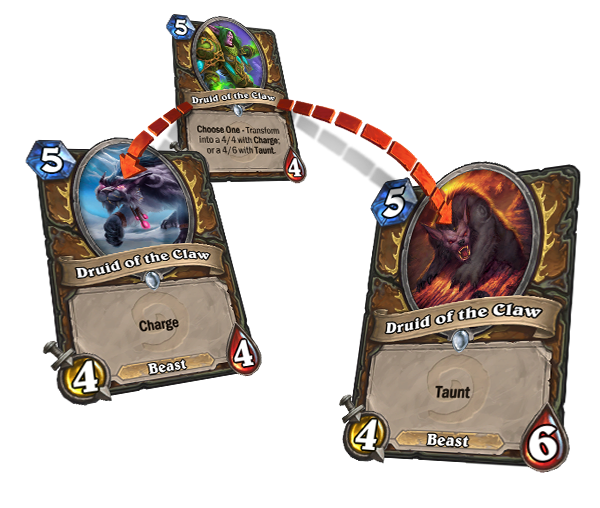 Affected cards include: Shellshifter, Druid of the Claw, Druid of the Flame, Druid of the Saber, Druid of the Scythe, and Druid of the Swarm. Players that achieve Rank 15 or higher during their Hearthstone career can no longer fall below Rank 20. This should ensure better matches for rank 20 to rank 25 players. 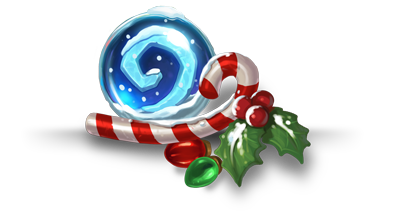 Be sure to visit the Tavern starting December 18 to cozy up by the fire for a nice round of Hearthstone! Acquired from Winter Veil 2018. Acquired from winning five games in Ranked Play, January 2019. Acquired from winning five games in Ranked Play, February 2019. Acquired from successfully completing a Rumble Run. Game Mechanics Update – Different damage redirection effects can chain with each other, but each one will only occur once. Re-directed damage is applied before modifiers (e.g. Cursed Blade) and will only damage the final target once. Added a black and purple sparkle effect to indicate when cards and powers that normally provide healing will do damage instead (such as when affected by Auchenai Soulpriest). The Rogue Quest card, Crystal Core, now applies to minions in your deck, rather than applying after they are drawn. Enchantment tiles now use a square border like history tiles. Deathrattles that move a card to hand or deck will no longer sometimes prevent its other Deathrattle effects from triggering. Fixed an issue that could prevent Augmented Elekk from activating. Tracking will no longer sometimes make a card invisible when your hand is full. Resolved various minor UI and visual issues. Resolved several interaction issues in single-player content. Set watermarks will no longer appear on non-collectible cards. An Undo button is now available after disenchanting a Wild card when in New Player Ranks. 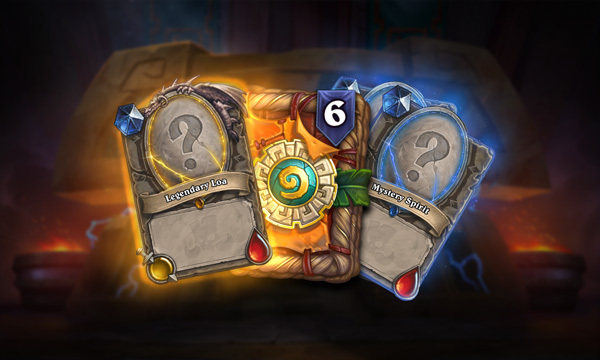 When at Legend in both Standard and Wild, if the Wild rank is higher, it will once again be shown on the Quest Log and Friends List.